Today was a play date with Robbie’s three birthday buddies. 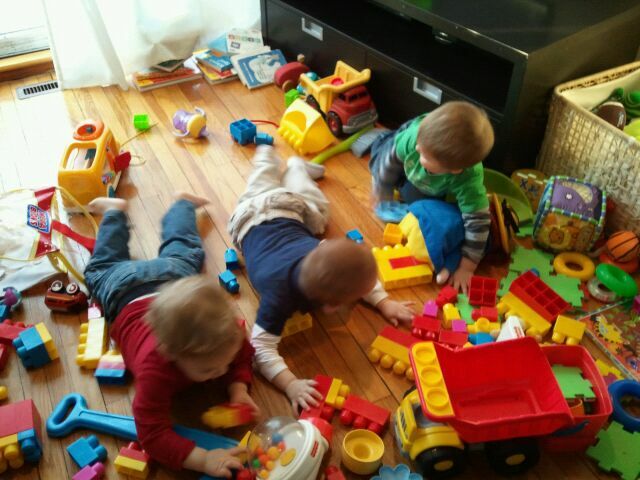 Things got a little crazy when the Legos were dumped all over the floor. Max even started a swimming expedition in them! Although he had a good time playing with everyone else, Rob needed a few minutes to himself to just be one with the toys. Unfortunately, no one could go outside to play. They just licked the window and played hide-and-seek with the curtains instead. The boys had a dance party, too. I’ve never seen anything quite like it… And I’ll do my best to get the video of it up tomorrow, so make sure to check back! 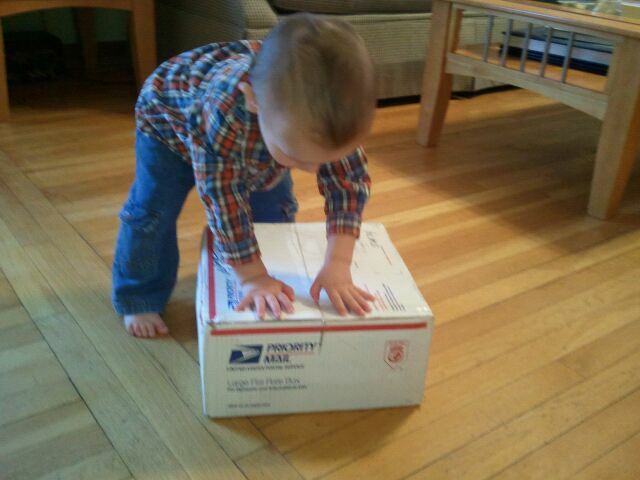 We’ve been planning to get Robbie his passport for a few months, and today was passport day. I had everything together, and we got to the post office at 11:35, leaving us plenty of time to meet the noon cut-off. Until we walked through the door and saw a sign that read, “New Passport Hours. Saturday 9:00-11:00.” Great. Just great. Fortunately, I am not one to take no for an answer, especially when I haven’t even asked the question. Justin, Robbie, and I patiently waited in line (I had a very belated baby gift to mail to my cousin). When we got to the front I asked Steve (my newest postal friend) if there was any way he could still accept a passport application, explaining how hard it is to get both parents together to apply for a child’s passport. Steve went to the back, found that they had not sealed up the passport applications at 11:00, and agreed to help us. Despite the line out the door of other postal customers and only one other person working the counter. The whole process took about fifteen minutes, including the picture portion. When we went to the back to get Robbie’s picture taken, I expected to see irritated people. It appeared, however, that Robbie had made a few friends in line. There were actually a few people who clapped when Robbie got the picture taken successfully on the first try. Who knew? 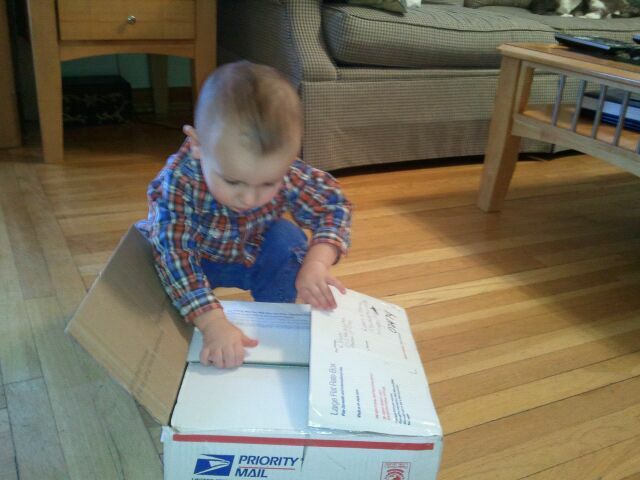 Roberto’s day continued to get better when the mail came. There was a package from a friend who has recently moved from California to Georgia. Before leaving, she kindly packed a box of oranges from her back yard and mailed them to Robbie. He wasn’t too sure what to make of the package at first, but as soon as I got the tape cut for him, he was all about getting it open. Robbie threw open the flaps of the box, grabbed the bag of oranges, and pulled it out with a brute strength I’ve never seen from him. He dragged the bag across the room and immediately set to opening it. He got frustrated when he realized the bag was knotted and brought it over to me to open. 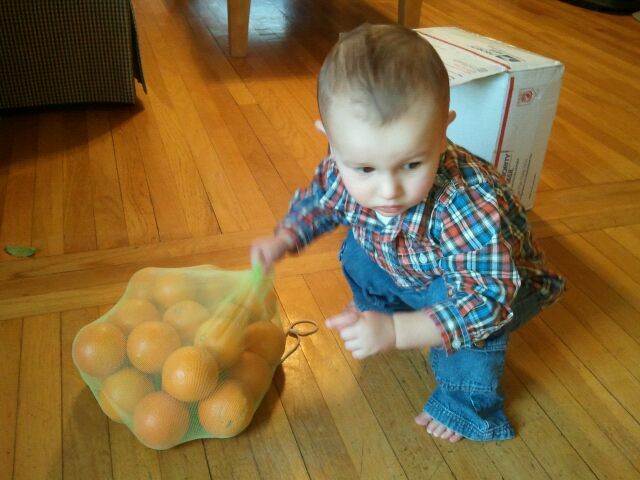 I opened the bag and Robbie dove into the oranges. He pulled one out, sunk his teeth into it, and brought it to me to peel. Since I wasn’t moving fast enough, Robbie ran back to the bag of oranges, selected another one, bit it, and tried to start peeling it himself. 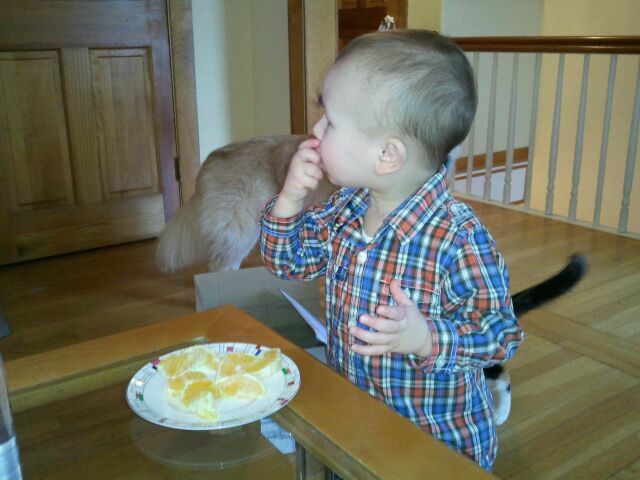 He was not able to patiently wait for me to peel any of his oranges. He howled as I peeled one, waiting impatiently to sink his teeth into the fruit. I’m a nerd. As soon as I heard about the show at Fenway, I knew I had to have tickets. My good friend Louisa said she wanted to come up for the show 04 June, but it was sold out before we even thought about making the plans. And then the announcement that they were going to do a show at Fenway. I had to have tickets. And I was extremely prepared to make sure that I had the tickets as soon as the American Express pre-sale began. Too prepared. Entirely too prepared. I got through immediately and bought four tickets in the section closest to the stage. I couldn’t believe my luck and immediately sent out an email to call off the other ticket purchasers. But it was too late. Thirty seconds later, I got another confirmation email for four more tickets. My friend Amy was trying to go through with our card as well. Three minutes later, Louisa’s mom sent an email saying that she, too, managed to get four tickets. So, if you did the math, you’d know that we have twelve tickets to the concert. And I was worried we might not get any! The great news is that now my friend Julia and her sister are going to go, too. And we can sell the four expensive tickets on StubHub! It’s going to be a.mah.zing. So much better than the first time I saw either the New Kids (when I was ten) or the Backstreet Boys (when I was twenty and still technically too young to drink). Let the countdown to 11 June begin! And a VERY happy birthday to my favorite little seester! I hope it’s even more fabulous than you dreamed. I love you! I am also a terrible mother for not wishing Robbie a very happy 18 months. What a day! I pulled a novice mom move today. The doorbell rang, and I left Robbie unattended upstairs. I figured it would only take me a few minutes to get rid of whomever was knocking. I’ve gotten good at the “I-have-a-baby-upstairs-and-dinner-burning-on-the-stove-why-are-you-inconveniencing-me-right-now?” thing. I use it with religious people and magazine salespeople (is there a sketchier job than that?) who come knocking. But this time, they had something I was interested in: Verizon FIOS. I took a few minutes to fill out the forms and will soon be saving $30 a month on my Internet, cable, and phone services. And I’ll be getting HBO for free (I’ve been missing the last season of Big Love, for Pete’s sake!). All of a sudden it got very quiet upstairs. I joked that I was sure I’d hidden all of the Sharpies. I hadn’t. Luckily, they didn’t find the furniture. Just Robbie’s Thanksgiving drawing and daycare picture. And a picture frame (he also tore what was in it). And the picture of a friend’s daughter – he really got that one. He found Justin’s glasses. Justin needs new glasses now. There’s only one lens and the left arm bends at a funny angle. So, I did the only thing a mother could do. I fixed dinner and called Justin to let him know we had good news and good news. The first was that we were going to save $30 a month. The second was that he could get that new pair of glasses he’d mentioned getting a few months ago. And, fortunately for me, Justin was pleased with the good news all around. I remember when it seemed like Robbie’s three-month check-up would never come. It seemed like he was never going to be a big boy, just a little baby who fit in the awful denim sling that saved my life the first nine months. I would never need the umbrella stroller my mom got for me. 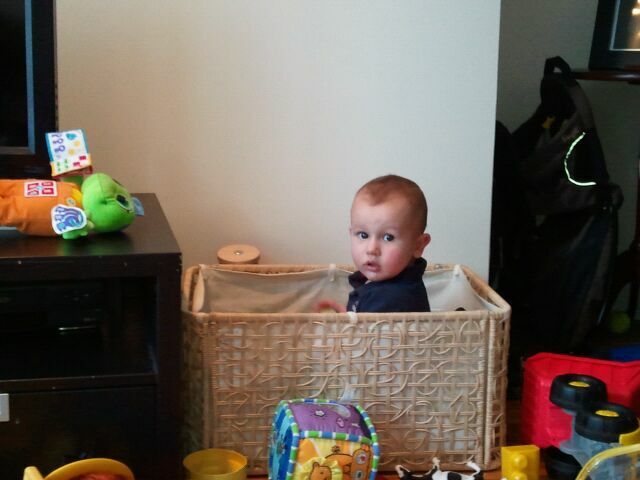 Robbie would never be big enough to fit in all those monstrous 12-month clothes people gave me at my showers. But, slowly, it happened. Robbie started to grow up. He grew out of the sling. The umbrella stroller became a fixture in the Jeep. We bought another one for the Honda (mothers really do know best). And Robbie wore those 12-month clothes. And quickly grew out of them. Today was Robbie’s 18-month check-up. It seems like he’s been here forever, but I’m not sure how forever managed to go by so quickly. He weighed in at 25 pounds, 12 ounces. For those of you with exceptionally creepy memories, you’ll notice that he only gained six ounces over the last three months. I was a little concerned. Then I saw how much he grew. Right at 2.5 inches. No wonder I noticed his belly disappearing! He’s back down to the 55th percentile for weight and back up to the 95th percentile for height. Fortunately, Robbie was diagnosed as a normal 18-month-old. Particularly the screaming when Dr. Sheldon approached him with her stethoscope. And forget about when she tried to look into his eyes. I had to hold him down so she could check his ears. Three minutes later, the tears had dried and kisses were blown in an attempt to reconcile. Mission accomplished. Apparently I don’t give my son enough to drink. You wouldn’t know it by the soaked pajamas and super-saturated diapers (you know you’re impressed with the science word). But, apparently it’s true. We got home around 5:45 today (I “ran” 3.5 miles today for the first time in probably three months!) and started getting dinner together as soon as we let Barkley out. I looked down while cutting my broccolini (FABULOUS stuff – thinner than broccoli) to find Robbie sucking on a paper towel. That he had soaked in the dog bowl. Really? You’re so thirsty that you had to drink from the dog bowl? Now, once I got past the gross-out factor, I had to admit that I was impressed. Robbie got the paper towels down from the counter, tore one off more neatly than I would have, and balled it up to put in the dog dish. I’m not sure if it was mere coincidence or if Robbie realized this would be a good way to get water. You’d think we hadn’t given Robbie anything to drink at dinner (he had a whole cup of water that he barely touched). As soon as he got in the tub, he started drinking the bath water. Yes. Bath water. Disgusting, soapy, luke-warm bath water. Classy. 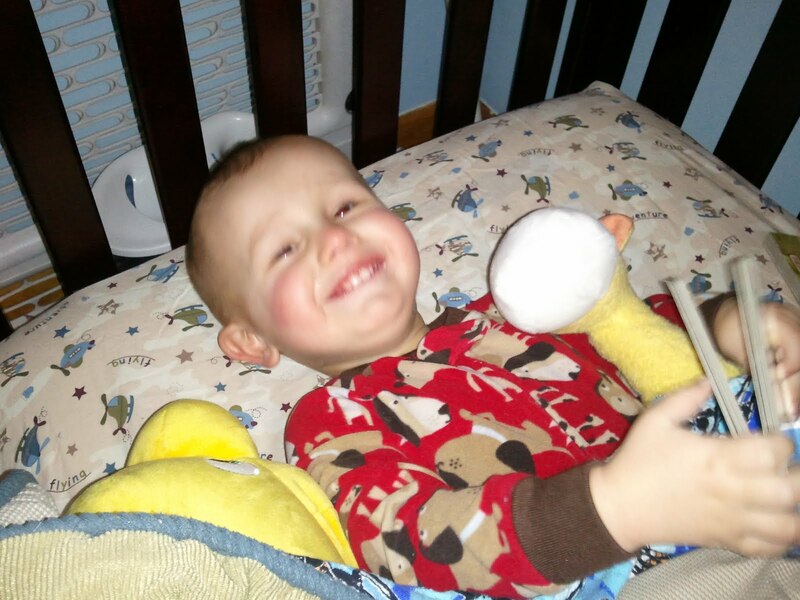 As he learns more words, Robbie is learning to express himself to get exactly what he wants. Usually, it’s food. Since he doesn’t know exact words for all the foods he likes, he’s had to find one word to encompass everything. “Num! Num!” seems to cut it. If someone has food that Robbie wants, he walks up, says “Num! Num!”, and opens his mouth. At the table, he stares us down and says, “Num! Num!” louder and louder until he gets the bite that he wants. Tonight, it was asparagus and mushrooms. He wanted spinach once but promptly decided it wasn’t worth his efforts. He surprised me a little with the asparagus, though. At one point tonight, he had pieces of asparagus in both hands. All of a sudden, he wants to eat everything. English muffins. Eggs. Cheese. Grapes. Oranges. Apples. Oyster crackers. Ravioli. Peanut butter. Bread. Pasta. Carrots. Turkey. Chicken. Asparagus. Snow peas. Mini corn. Mushrooms. But, for the most part, he only wants the vegetables if they’re on my plate. For the time being, I’m OK with that. At least he wants them! 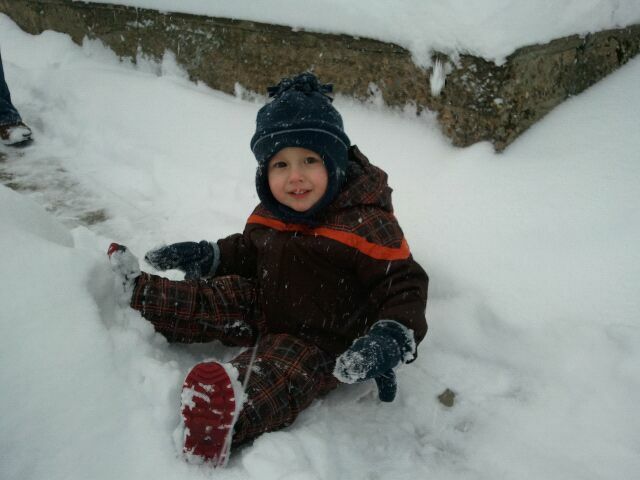 Robbie got his second chance at a snow day yesterday. We thought about taking him to daycare but ultimately decided that the two plus hours it would take us to get there and back in the snow (and the possibility of a terrible car wreck) wasn’t worth it. Instead, we had a nice family day until Justin had to leave to go to class. 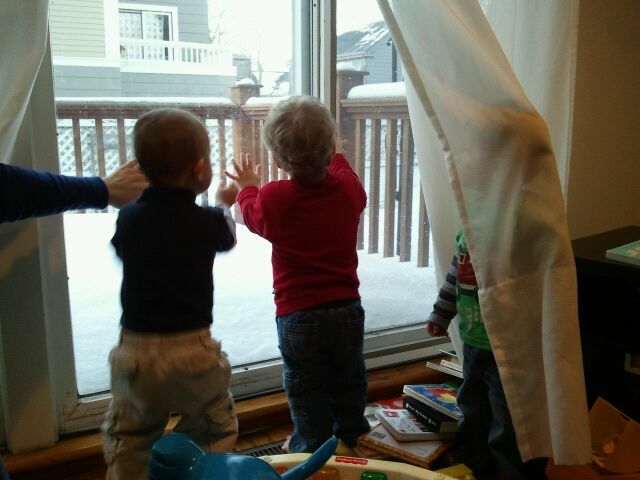 We slept late, which is always an auspicious beginning to a snow day. 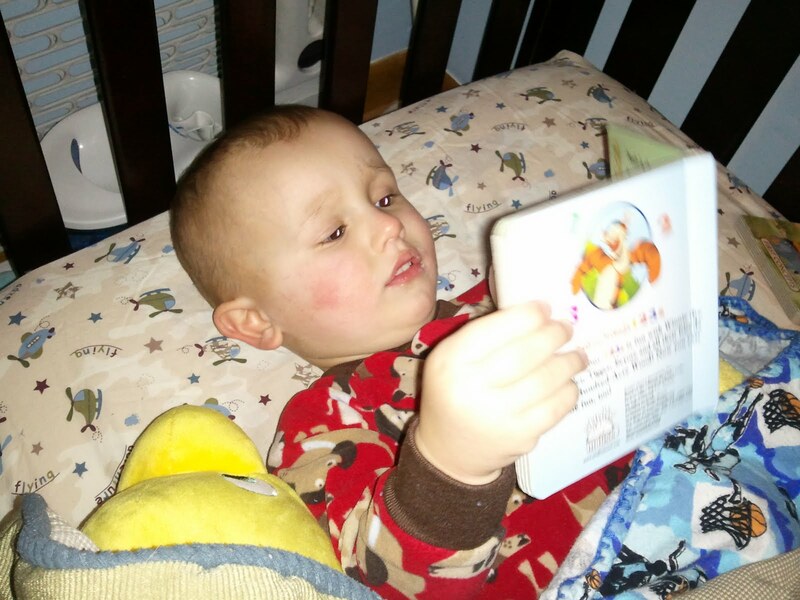 Robbie got up at 6:00 but was content with a bottle, some books, and some animals in his crib until around 8:00. I have no idea what he talks about in there, but I wish I knew. He sounds like he knows exactly what’s going on in the conversation. I’m getting to where I can understand some words in what he’s saying, but it’s usually just the last one or two. Maybe he’s speaking English with a heavy Chinese accent? There was a lazy family breakfast and some work for Justin. Robbie and I played and got ready for a little fun in the snow. After forcing his body into my brother’s old snowsuit, I ventured to Target Wednesday night to purchase a new one. Silly me. They don’t have snow suits out in January. You know, snow season? They have bathing suits. After much searching, I found the LAST snowsuit. Fortunately, it was a size 2T. Robbie seemed to appreciate this outfit much more than the other one. He looked like he was ready to hit the slopes! We were a little nicer to Robbie this time around; we actually waited for the snow to stop. 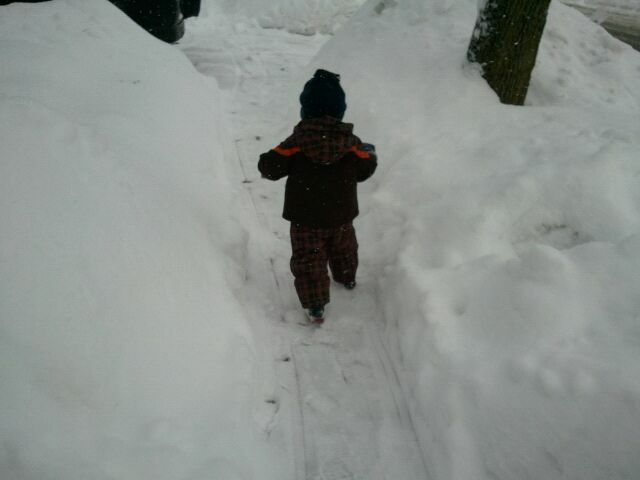 He made it the entire way around the block in his sled and only fell out once. That was my fault… We decided it would be easier to walk in the street, but there was a pretty big snow build-up in the driveway. I was just so sure we could easily get the sled over it. And we did. It was just the baby we had a hard time with. Robbie seemed to deal with rolling into the street and getting a face-full of snow well… Well, as well as he could. There weren’t any tears, so I’m counting it as a victory. 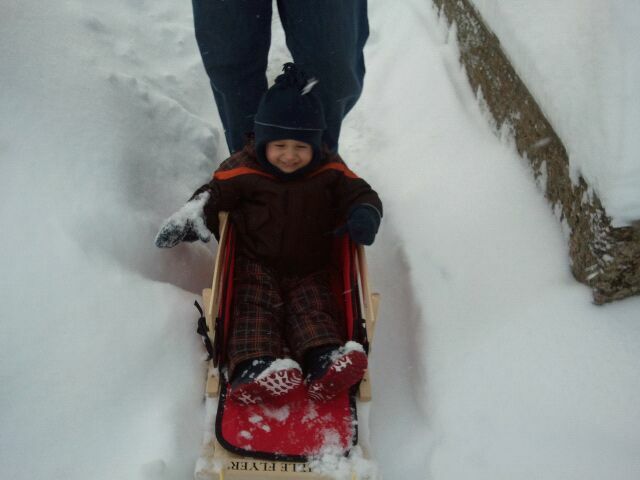 When we got home, I let Robbie escape the sled. I’m not quite sure what I expected him to do, but I really didn’t expect him to take off running down the street. Which is exactly what he did. That kid’s got some speed, even in snow boots one size too big (you can’t be too picky when they’re a quarter at a rummage sale). You know, not that I think about it, the key to a happy snow adventure is really mittens. That’s where we went wrong both times Robbie went out for the last storm. He likes picking up the snow, but it really throws him for a loop when it’s not blocked by good mittens and his hands get cold. Interesting. For a long time, Robbie hated books. The last thing he wanted was to sit on my lap to read. We’d get through a few pages and then Robbie would start twisting and crying. However, once Robbie learned the word “book”, things changed. 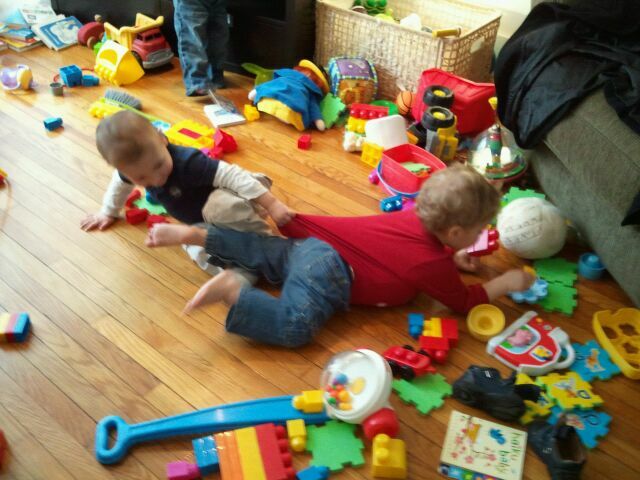 All of a sudden, they are his favorite toys. The other day, he asked for “more books”. Robbie turned, looked at me like I was crazy, ran to me, crashing into my legs with a big hug and a huge grin. He nearly leapt into my arms and sat through all three books. And then it was time for bed. Robbie went happily into his crib (after feeding Ish, of course). He grabbed Moo, his giraffe, and laid down. Robbie rolled over, grabbed another book, and immediately got to reading.